GREG Combet will today move to ease average household power price rises by about $50 a year by deepening cuts to incentives for people who install solar panels on their roofs. The Climate Change Minister is expected to announce another scaling back of the solar credits scheme — the second such move by the government in six months — which will see the average rebate to households installing a 1.5 kilowatt system in Sydney, Melbourne, Perth or Adelaide fall from $6200 to $3720. Today’s announcement, which comes as the government becomes increasingly concerned about the impact of rising cost-of-living pressures on its electoral stocks, is expected to save householders between $25 and $35 next year. This is on top of changes announced last December that were expected to save $12 a year. This will be achieved by lowering the amount of high-cost power that electricity retailers must buy under the government’s renewable energy target. As it moves to confront cost-of-living pressures, the government will also today announce it will ask state and territory governments to make sure their feed-in tariffs “do not impose an unjustifiable burden on electricity consumers”. Mr Combet will argue the scale-back was vital in light of continued growth in the industry and its impact on power prices. But the government will honour existing written contracts to install small-scale solar panels made under current arrangements. Solar panels are granted renewable energy certificates based on the amount of power they produce. Electricity retailers must purchase the certificates at $40 each under the government’s amended RET. Under the solar credits scheme, householders are eligible for an upfront payment worth five times the value of certificates their solar panels will produce. That was to have been scaled back to four times from July 1 under changes announced in December but the scale-back will be deepened today when the government declares the multiple will be cut to three from July 1. The move will hasten the phase-out of the scheme. The multiple will fall from three to two from July 1, next year and then revert to one from July 1, 2013. Mr Combet will argue that strong demand for solar panels had continued despite December’s announcement, fuelled by declining system costs, the strong Australian dollar and economy as state and territory feed-in tariff schemes. He will also argue the generous support for solar panels has contributed to a fall in the installation of solar hot water heaters. The drop in the multiplier will help reduce the oversupply of renewable energy certificates. Under the solar credits scheme solar panel installation has ballooned. The number of installations supported by the RET grew from 15,000 in 2008 to more than 60,000 last year and 120,000 last year. The Australian also understands the government has been concerned that the solar panel scheme was favouring affluent home owners, while renters and lower-income earners were subsidising the scheme through higher power prices. There is a last-minute rush from homeowners wanting to buy solar panels before the solar credits rebate is slashed by up to $1200 from July. Some solar installers are so busy they have declared their books full and are turning away customers. Power-One, Inc. a leading provider of renewable energy and energy-efficient power conversion and power management solutions, announced today that it will open its new manufacturing facility in Phoenix, Arizona. The Power-One Phoenix facility will produce its industry-leading photovoltaic and wind inverters, including single phase (2-6KW) and three phase string inverters, and NEMA 3R 250KW, 300KW and 400KW central inverters. In the future, for wind applications, the product range will include 2.5 MW inverters. Production will commence in October 2010 and the facility is anticipated to support more than 350 new jobs in Arizona and throughout the United States. The new manufacturing plant will reach an annual inverter production capacity of 1.0 GW by mid 2011. Power-One has been able to expand capacity with the recent commencement of Canadian manufacturing and the expansion of its European plant, which will result in global capacity to annually produce more than 4.0 GW of inverters by year-end 2010. In addition, Power-One plans to launch Chinese production in the fourth quarter with products specifically designed for the requirements of Asian markets. As every middle-school child knows, in the process of photosynthesis, plants take the sun’s energy and convert it to electrical energy. Now a Tel Aviv University team has demonstrated how a member of the animal kingdom, the Oriental hornet, takes the sun’s energy and converts it into electric power (in the brown and yellow parts of its body) as well. “The interesting thing here is that a living biological creature does a thing like that,” says physicist Prof. David Bergman of Tel Aviv University’s School of Physics and Astronomy, who was part of the team that made discovery. “The hornet may have discovered things we do not yet know.” In partnership with the late Prof. Jacob Ishay of the university’s Sackler Faculty of Medicine, Prof. Bergman and his doctoral candidate Marian Plotkin engaged in a truly interdisciplinary research project to explain the biological processes that turn a hornet’s abdomen into solar cells. The research team made the discovery several years ago, and recently tried to mimic it. The results show that the hornet’s body shell, or exoskeleton, is able to harvest solar energy. They were recently published in the German journal Naturwissenschaften. Discovering a new system for renewable energy? Previously, entomologists noted that Oriental wasps, unlike other wasps and bees, are active in the afternoon rather than the morning when the sun is just rising. They also noticed that the hornet digs more intensely as the sun’s intensity increases. Taking this information to the lab, the Tel Aviv University team studied weather conditions like temperature, humidity and solar radiation to determine if and how these factors also affected the hornet’s behavior, but found that UVB radiation alone dictated the change. 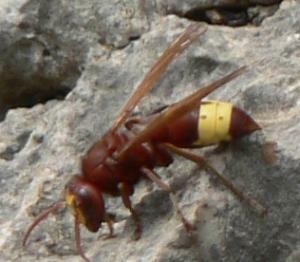 In the course of their research, the Tel Aviv University team also found that the yellow and brown stripes on the hornet abdomen enable a photo-voltaic effect: the brown and yellow stripes on the hornet abdomen can absorb solar radiation, and the yellow pigment transforms that into electric power. The team determined that the brown shell of the hornet was made from grooves that split light into diverging beams. The yellow stripe on the abdomen is made from pinhole depressions, and contains a pigment called xanthopterin. Together, the light diverging grooves, pinhole depressions and xanthopterin change light into electrical energy. The shell traps the light and the pigment does the conversion. A team from the University of New South Wales is hoping the sun will lead them to a Guinness world record for fastest solar-powered vehicle. Alice Springs will soon be home to the largest tracking solar power station in Australia. The $6.6 million, one megawatt power station will be built on the outskirts of Alice Springs, and should be completed by May 2011.